"I made this meal for my grandma when I was a kid and it's super simple and a great idea for kids to make to start to learn how to cook!" Place hot dogs in a saucepan and cover with water; bring to a boil. Reduce heat to medium-low and simmer until warmed through, about 5 minutes. Drain. Roll crescent dough onto a work surface; tear into 8 pieces. 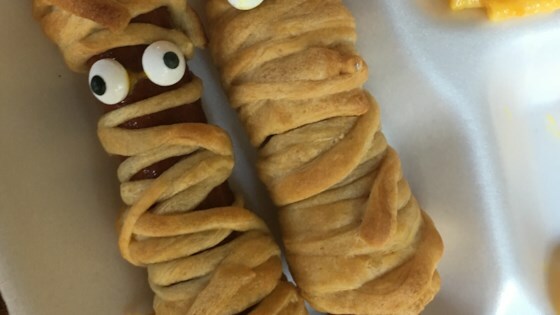 Roll 1 piece dough around each hot dog, creating the look of a mummy. Place dots of mustard on the top of each for the eyes, nose, and mouth. Arrange hot dogs on a baking sheet. Bake in the preheated oven until crescent dough is golden brown and flaky, about 10 minutes. Cute & tasty crescent dough 'mummy-wrapped' hot dogs. You can change the mustard features to ketchup or something else or you could add hair. It's your preference! Super simple and kid friendly. I skipped the boiling step and just rolled up the cold hot dogs. They were perfect! Super good! My whole family loved it. My little brother loved them the most. I recommend making these. Didn’t have any premade croissants so used pizza dough, works just as well! Super easy and quick. Not the healthiest, but there weren’t any leftovers even with my picky eater. I will definitely make this again next Halloween and maybe a couple of times in between! I made this for the halloween party for my friends and all you have to do is take some biscuits ,hot dogs and cheese and boom you got hot dog mummies. Super cute! We found they just needed a couple of extra minutes in the oven to brown up, but delish! Very funny to put them in kids lunches on Halloween!